Summer –heat-seaside : what do all these bring to mind? Fish, glorious fish. The trick is to combine your wish for fish with your efforts at economy. Here are a couple of suggestions. Marida – a very small, very cheap and therefore usually fresh fish. It is easily cleaned – you can actually eat the bones if you are feeling bold enough. Just scale it, flour it but dust it as well to remove excess flour and deep fry. With a nice fresh salad of your choice you have an excellent, nutritious and cheap lunch. 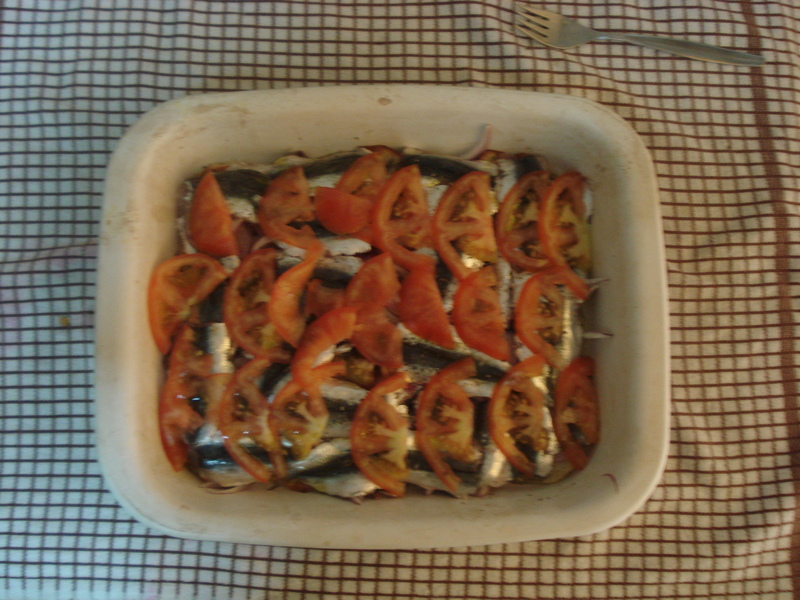 Sardines or sardella as it is called in Greece. We are all familiar with it but try this easy way that also allows you to avoid frying. Scale and clean the fish. Slice 4 medium potatoes and line them as evenly as possible on the bottom of a pan. Sprinkle with olive oil – not too much- and oregano. Cook in the oven until almost done – 30 minutes more or less. While your potatoes are cooking sprinkle one tablespoon of olive oil and some oregano over the sardines. Kids are often weary of fish bones so you can fillet them to make them more palatable. Remove the pan from the oven, layer the fish on top of them, add onion rings and some crushed garlic and top the dish with sliced fresh tomatoes. Cook for not more than thirty minutes. It actually depends on whether you want the fish crispy or not. Before serving dust with some finely chopped parsley for more colour. Married sardines: Fillet the fish removing its head and entrails in one move. Put a slice of tomato in the middle and fold it. You can just grill those and serve with boiled vegetables like broccoli, zucchini or potatoes or a salad- like, grilled mixture of all three with a mustard dressing. Fresh tuna – clean and fillet. Spice with a mixture of olive oil, oregano and capers. Grill and serve with vrasta horta – similar to dandelions but of an extreme variety, a very high dietary value and a very low price. The expensive version is the ones picked on the mountains by local women. They taste far superior but cost almost double. The rich taste of the fish is complemented by the almost bland taste of the horta. Finally try a kolios- chub mackerel according to a dictionary but I will find you a picture anyway grilled over coals – Its rich and filling taste can be accompanied only by a grilled potato in its skin. For something more Greekish grill a chubby eggplant, remove the skin, add some garlic, diced tomato and chopped parsley and a teaspoonful of lemon juice.